Most banks are pretty awful, right? 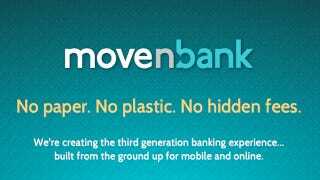 So how about switching to Movenbank, an online, third generation banking experience? A few small caveats: there are no branches, you don't have a card, you can't get cash, and it's a terrible idea. "This is the reboot of Banking as we know it. Movenbank will combine the best aspects of both a financial services provider and a customer-focused, tech start-up. It is integrating mobile, online engagement, social media and gamification into a new kind of customer experience for banking products and financial services," said King." I think it's safe to say there will be more buzzwords in this bank than there are units of currency. So, okay, let's ignore all of the massive shortcomings of a bank where you can't withdraw any money, and are confined to an extremely limited set of NFC-enabled phones and stores if you want to "buy things." Movenbank's not just neutered, they're obnoxious—social media and gamification?